Talk about jumping the shark! This Frozen short was not very good. And it felt endless! I wish they had "warned" us about it when we bought the tickets! Not more than two laughs in it, and the songs, yes songs plural!, were totally unmemorable! The thing went on so long, and was so boring, that I feared I had walked into the wrong theatre! And my daughter, aged 9, totally agreed! It was interesting too that the short was so "white" compared to the film it came before, which felt so diverse. I think they need to put the Frozen franchise out to pasture. Let it go. Please. 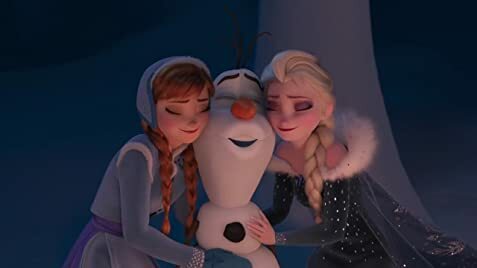 Right from the beginning, directors Kevin Deters and Stevie Wermers, producer Roy Conli, and executive producer John Lasseter envisioned Olaf's Frozen Adventure (2017) to be as a setup for the upcoming film, Frozen II (2019), where the actions and decisions made by the characters in the short film will set the stage for what's to come in the second film. Olaf: Yes! A tradition is saved! Olaf: I guess hawks need traditions too. , "That Time of Year"